How Do I Beat IBS (Irritable Bowel Syndrome) With A Raw Food Diet? , but I seem to have the symptoms and have had them for the last 2 months. Fortunately I don't have any of the giveaway symptoms of colitis or Crohn's. I began eating a mostly raw food diet about a week ago for the most part. What kind of meal plan should I go on? About when can I expect to notice a difference in how my gut feels and my regularity? Sorry for all the questions, I just have high hopes for the Raw lifestyle to work and I so appreciate your work and dedication to this. There is no quick and easy generic answer to any of those questions. The three bowel disorders you mention are indeed quite similar and caused by related factors. Often, which one you have is somewhat superfluous because of the large overlaps; more important are the types and severity of the symptoms experienced. When working with patients with any these issues through my coaching program I'm generally interested to find out whether they tend toward constipation or diarrhea, if they're experiencing blood and pus in their stools, info about gas, whether they're experiencing significant amounts of pain, and other factors. The answers to these questions changes the type of diet I suggest. A great many people with IBS can't handle the roughage of raw vegetables, for instance, so I sometimes suggest clients avoid these. Easy to-digest-fruits of select types often form the entirety of diet until their bowels have healed enough for them to eat vegetables again. The time to full recovery will vary depending on a lot of individual factors. Moderate cases usually heal in less than a month, but others take a bit longer. There are some cases where the bowel has become so severely damaged that a water fast is necessary for healing to take place. Learn more about Andrew's raw food coaching program. How to eat a healthy raw food diet. For people with healthy bowels, what foods should be eaten and what should be avoided. 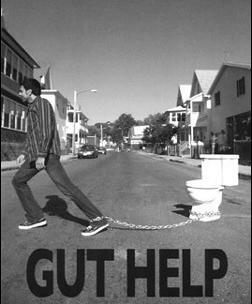 Constipated or don't feel like you ever have full bowel movements? Learn what's behind it.